I have a domain user - LAB\usertest - who is a member of the Domain Users group and also a group called testgroup. I want to make sure he can access all the shares before I start making changes to NTFS permissions (which are currently inheriting Everyone Full Control). Now I restrict NTFS permissions on the qtrees so LAB\usertest does not even have traverse permission, but they will have NTFS permission to the folders in the Qtrees. qtree1 and qtree2 only have Domain Admins with Full Control and no other permission. folderQ1 and folderQ2 have testgroup with modify permissions. And we do similar with the folders and sub-folders. 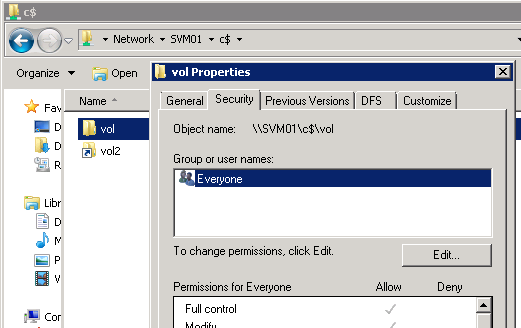 folder1 and folder2 only have Domain Admins with Full Control and no other permission. folderF1 and folderF2 have testgroup with modify permissions. Below are the results of testing with Net Use. The Results are As Expected! The results above are all as expected. If you try using net use to connect to a share, and you don’t have NTFS permission to the folder the share is based upon, then you won’t have access, and it will prompt for a username and password for a user that does have access. And these also all worked fine! Note: If you are considering doing this, please check with NetApp support before you do so, as I understand clients will need to reboot to take the new setting - that is - clients who are connected will continue working for a bit, then lose access until they reboot (with 8.2.2P1)!